Every early November, there is a HUGE horse racing event held in Australia called the Melbourne Cup. When I was growing up, it was all about luncheons for the ladies and placing bets on which horse would win. It is a lot of fun and it involves champagne, so I am totally down for it. Since I started traveling the globe for hubby’s work 13 years ago, I still find a chance to enjoy the race and place a bet. The last 2 years I have co-hosted with an Aussie friend and we invite all the other Aussies we know in the area to meet us at a bar where we stream the race live, drink champagne, beer on tap and eat fish and chips. So what to wear, what to wear, what to wear, the question of my life. A fascinator or a hat is paramount. 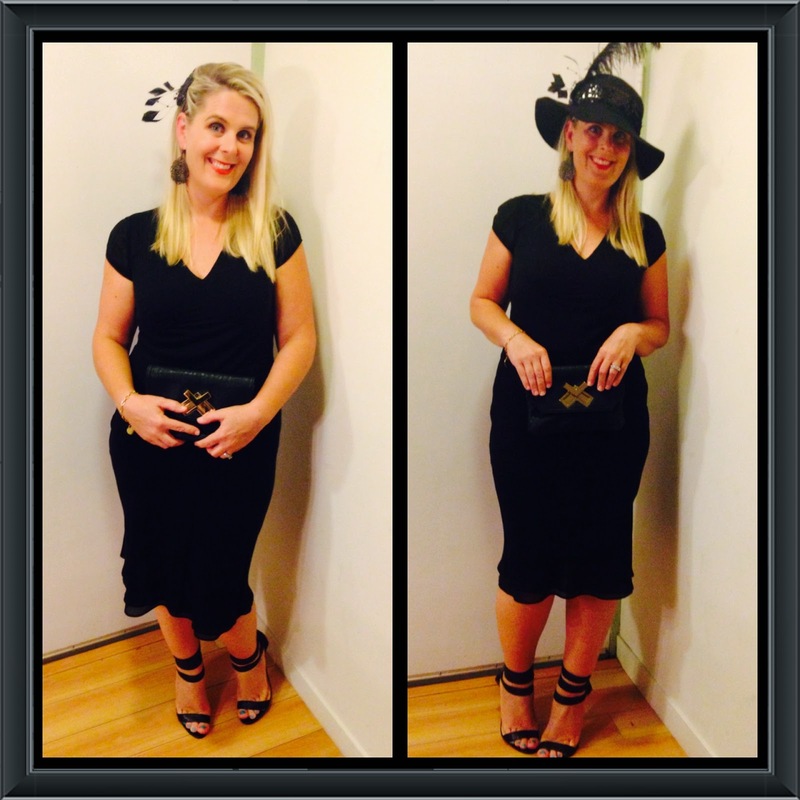 I wore a fascinator last year so this year I opted to see what I could do with a big floppy black hat. I have been eyeing these hats for this season and what a perfect opportunity to get it into my wardrobe. Honestly, I think I am more in love with the hat, than it me, but I was determined to make it work and sometimes styling calls for pushing ourselves out of our comfort zones so I am being the perfect example of how to try new things even if you’re not sure they totally work. Play with it and have some fun. In the end, I had two options up top, I could just wear the fascinator or stack the fascinator on the hat adding to the sequins and feather I already had. Since there is quite a shadow cast over my eyes with the brim of the hat, I applied heavier eye make up than I normally would. It was a night event too so darker was appropriate. So here you have it, Hat and No Hat. I love versatility. Now to see the rest of my Melbourne Cup details. My much loved Julianne Hough for Sole Society shoes, simple black earrings and my trusty black clutch. I have to add that I did find photographing myself with the hat a real challenge. I am not a trained photographer and don’t know any fancy tricks to use with my iPhone. The challenge is the lighting, see for yourself. Live and learn, I say. Now for the Grand Finale, the Hat! I added these two pieces onto the hat. I already had the items in my drawer. One is a Flapper headwear I constructed for a Flapper party a few years back and the other is a mini fascinator I have had forever but never actually worn. Stacking them on the hat, helped me bling it out and the shiny sequins gave the right amount of shimmer to a totally black outfit. The sequins were on a stretch headband so it very simply stretched onto the hat. Hope you enjoyed seeing my Melbourne Cup outfit, it wouldn’t be right if I didn’t share it with you all. And you looked quite fabulous and would have done so if you were at Flemington!